MWC 2016 may not have officially started yet, but Samsung and LG have already set the tone for what should be a very exciting trade show. Both companies took the wraps off of their respective flagship offerings earlier today, and with both smartphones launching within hours of each other, the obvious question on everyone’s mind is with regards to how they fare when pit against each other. 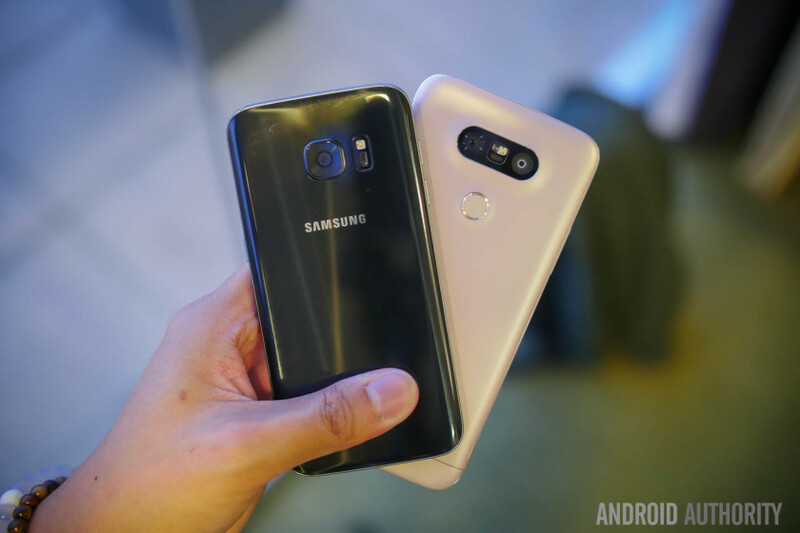 That’s what we find out, in this quick look at the Samsung Galaxy S7 vs LG G5! 2015 was the year where Samsung introduced drastic changes to their flagship Galaxy S series, with a more premium design and build quality, albeit at the sacrifice of certain staple features like microSD. On the other hand, last year’s G4 may have come with some refinements across the board, but for the most part, LG stuck to what was tried and tested. This time around however, there has been a complete role reversal, and while Samsung continues to improve on what it started last year, LG has made some dramatic revisions to their flagship G series. Starting with the Galaxy S7, returning is the premium metal and glass unibody construction, and unsurprisingly, the latest flagship does share a lot of its design language with its predecessor. However, it was a great to decision to bring some elements from the Galaxy Note 5 over as well, such as the curves along the sides of the back, which add significantly to the handling experience. The camera module on the back doesn’t protrude as much either, and also making its way back into the fold is expandable storage via microSD card, which a lot of users will appreciate. On the other hand is the LG G5, which looks entirely different from its previous iteration. The power button remains on the back, with a fingerprint scanner integrated into it, but the volume rocker has been displaced from its position on the rear, to the more standard left side. Of course, the big news here is the full metal unibody construction of the device, but LG has managed to figure out a way to continue to offer a user-replaceable battery. We have discussed the modular aspects of the device extensively in the hands on with the LG G5, but what you are essentially able to do is take out the bottom panel, take off the battery, and add it to new modules that expand the capabilities of the device in various ways. Personal preference is always key when it comes to making a choice based on aesthetics, but with both devices now coming with premium designs and build qualities, things are a lot more even. While the Galaxy S7 may feel familiar, it does bring enough to the table to stand out from its predecessor. Props have to be given to LG for their out of the box thinking, and apart from figuring out a way to retain staple features despite making the jump to this new body, there are some unique capabilities thrown into the mix as well. The Galaxy S7 comes with a 5.1-inch Super AMOLED display with a Quad HD resolution, while a 5.3-inch IPS LCD display, with the same resolution, is seen with the LG G5. Both displays are as good as expected, but what is interesting this time around is the availability of Always On displays with both, which means that after the phone is locked, there will a section of the display that is always activated, to show the time, and any other pieces of information. The Galaxy S7 may offer a bit more in terms of features as far as the Always On display is concerned, but for the most part, both devices are quite limited in this regard so far. As for display performance, it will really come down to what you like better: LCD or AMOLED. Under the hood, the LG G5 comes with an octa-core Qualcomm Snapdragon 820 processor, backed by the Adreno 530 GPU and 4 GB of RAM. The Galaxy S7 will be powered by either a Samsung Exynos 8 Octa Qualcomm Snapdragon 820 processor, depending on the market. Regardless, all versions are paired with 4GB RAM. As far as performance is concerned, it has been really good in our short time with the devices so far, and certainly helping is the fact that the software experience has been heavily streamlined in both cases. Both devices come with fingerprint readers, and while they are located in different places, the method to trigger them are exactly the same, and requiring a press of the respective home buttons to unlock the devices. In terms of battery, the Galaxy S7 comes with a larger 3,000 mAh battery, compared to the 2,800 mAh unit of the LG G5, but only the Samsung device features wireless charging. However, both devices come with fast charging capabilities, which lets you get back up and running in a very short amount of time. The Galaxy S7 isn’t lacking in hardware features, but things remain conventional, which is why the LG G5 takes the crown as far as hardware is concerned, solely because of the expandable experience. You can add functionality to the device by simply popping out the bottom portion and connecting the battery to a new module depending on your needs. A few examples includes a a Hi-Fi audio DAC that can be put at the bottom to enhance the audio experience, as well as a camera module, called CAM Plus, which adds hardware buttons, like a shutter button, video record button, zoom scroll, and more, to better the camera experience, while also adding an additional 1,200 mAh to the battery. This is a very out of the box thinking on the part of LG, and if functionality over form is what you’re looking for, then the LG G5 does have more to offer when compared to the Galaxy S7. The Samsung Galaxy S7 comes with a 12MP rear camera with an f/1.7 aperture lens, which sports larger 1.4µm pixels, which should allow the camera to take in much more light, and should allow for some great shots, especially in low-light conditions. On the other hand, the LG G5 has its own trick up its sleeve, by adding in an 8 MP wide angle lens to accompany the 16 MP standard lens primary shooter on the back. Having a wider field of view is certainly good to have, and the good news is that it is a fairly seamless experience when making the switch between the two rear cameras. We can’t wait to put these cameras to the test, but if their predecessors are any indication, we can continue to expect great things from both these devices. Both devices are running Android Marshmallow out of the box, but as mentioned, the experience with either phone has been streamlined significantly. In the case of the Galaxy S7, the look and feel remains largely the same as previous iterations of TouchWiz, with a lot of the features hiding in plain sight, with the Settings menu housing a lot of the advanced features of the device. In the Settings menu, there is now a Galaxy Labs section, where you now have the option to turn off the app drawer. The lack of an app drawer is controversial with any Android device, but at least with the Galaxy S7, the choice is left to the user. Why this talk of the app drawer is important is because surprisingly, it is something that isn’t available with the LG G5 any more. LG claims that market research indicated that consumers were looking for more streamlined and simpler experiences with their smartphones, and eliminating the app drawer also removes the sometimes confusing menus that pop up when looking to uninstall or remove apps, or move icons around. Samsung did keep a lot of its TouchWiz features, LG has gone the other way, and removed features like Q Slide and Multi Window, all in an effort to offer a cleaner software experience. So there you have it for this quick look at the LG G5 vs Samsung Galaxy S7! When choosing between the two, what it basically comes to down to is what kind of experience you are looking for. The Galaxy S7 is a refinement of last year’s design, but brings back a key feature in expandable storage, while also making some useful additions, such as resistance to dust and water. If you liked its predecessor, but found it lacking in these areas, the Galaxy S7 may be the perfect smartphone for you. On the flip side, LG believes that there is going to be a stagnation in the smartphone space, and is trying to buck that trend by creating a whole new ecosystem to complement the G line. The design is radically different from past iterations, and it will take some getting used to, but this design allows for a lot of new functionality with the various modules, making for even more experiences to be available to the general user.